Previously, I talked about the homes where Walt lived in and around Hollywood. For this column, I am going to share the locations of the various Disney Studios where Walt worked. Again, let me remind readers that these are privately owned places, not tourist locations, even though two of them gladly welcome customers. In September 1923, Walt was living with his Uncle Robert (the younger brother of Walt’s father, Elias) and was unable to find any type of work at the Hollywood live action motion picture studios. Frustrated, Walt decided to try to get back into doing animation as he had in Kansas City. Walt bought an old used camera that was not in the best of shape, for $200 from a local Los Angeles camera shop. His older brother Roy had given Walt $10 to make up some business cards and letterhead paper proclaiming “Walt Disney, Cartoonist” and using Uncle Robert’s address as the location for his art studio. Walt asked Uncle Robert if he could set up his studio in the garage adjoining the house. Robert charged Walt an additional $1 a week to use the garage, in addition to the $5 a week rent. Walt had to tear up dry-goods boxes and find spare lumber to build a very crude camera stand and animation set-up. The equipment would not accommodate anything more complicated than the simplest of animation. Walt went to see Alexander Pantages, who owned a theater named after him, the Pantages, in downtown Los Angeles, as well as several other theaters. Walt pitched the idea of doing a series of short 30-second joke reels, like the Laugh-O-grams he had done for the Newman theaters in Kansas City. These reels would be weekly “exclusives” to run during the newsreel that would help publicize Pantages’ theaters. Pantages showed interest and Walt proceeded to film a sample reel using stick figures. Just before he could show the reel to Pantages, Walt received word that New York film distributor Margaret Winkler was ready to make a deal for Walt to produce a series of Alice Comedies combining a live-action little girl with animation. However, some early official Disney publications do identify the garage as Walt’s first studio because it makes for a great “rags-to-riches” story. The garage remained untouched for decades and was saved from destruction by a group called The Friends of Walt Disney in 1982, who donated it to The Stanley Ranch Museum (Heritage Park) located at 12174 Euclid Street, Garden Grove, California, 92840. Since he needed a larger studio space to fulfill the work needed for the Alice Comedies, Walt walked down the street two blocks west from Uncle Robert’s house to the Holly-Vermont Realty office. As former head Disney Archivist Dave Smith wrote in March 1982, “(Walt) did some preliminary work on a reel, probably in the garage, but word came on the purchase of a series of Alice Comedies, so the Pantages reel was never finished. Walt told the owners of the office that he only needed enough room “to swing a cat in” and could only afford a maximum of ten dollars a month. He was given a room at the back of the real estate office. Walt and Roy had to put up a curtain to block the room from the activity in the rest of the office. In 1924, for the early Alice Comedies, Walt and Roy also rented a vacant lot (three blocks away) at the corner of Rodney Drive and Hollywood Boulevard for ten dollars a month for shooting outdoor live action segments for the series. It was at this studio that Walt made the first Alice Comedy in Hollywood, Alice’s Day at Sea, that distributor Margaret Winkler received December 26, 1923, the day after Christmas. Walt was the only animator until Rollin “Ham” Hamilton was hired to assist in February 1924. Lillian Bounds had been hired to ink and paint on January 19, 1924. Also in February 1924 for forty-two dollars a month, the Disneys expanded their studio into the empty storefront next to the real estate office. The address was 4649 Kingswell Avenue and on the plate glass window was emblazoned in gold leaf the name “Disney Bros. Studio”. Walt was given a room at the back of the real estate office in Kingswell. Walt and Roy had to put up a curtain to block the room from the activity in the rest of the office. Roy’s desk was at the front and could be seen through the window. To the left of the entrance were the ink and paint girls. At the rear was the camera room next to the room with the animation desks where Walt worked until they could hire an animation staff. Today, the building is the home to Extra Copy, a photocopy business that has been there for many years. They have a homemade mural on the wall, as well as a bulletin board filled with clippings and photos, including a copy of Walt’s death certificate. Enthusiastic employees (including the owner) love talking to tourists about the fact that it was Walt’s first studio. As the success of the Disney Brothers Studio grew, Walt and Roy realized they needed their own studio not only to handle the current work, but to accommodate the expansions they wanted. In 1925, a week before Walt’s marriage to Lillian in July, Walt and Roy placed a $400 down payment on a plot of land between Griffith Park Boulevard and Monon Street on Hyperion Avenue. Walt had let Roy make the choice of the Hyperion location over another plot in Westwood they had considered. There was an existing stucco building about 1,600 square feet, and the Disney brothers had paid roughly $3,000 dollars for renovations. Roy O. Disney supposedly told Disney Legend Jack Cutting that Walt insisted the new studio be called Walt Disney Studios, although there are other versions of this story, including one Dave Smith heard from Roy that it was Roy’s idea to change the name from the Disney Bros. Studio because Walt was so clearly the focus of attention. It was in this studio that Disney produced the last of the Alice Comedies, all of the Oswald the Lucky Rabbit shorts and the early Mickey Mouse and Silly Symphony shorts. In addition, this was also the location where work was done on Snow White and the Seven Dwarfs, Pinocchio, Bambi and some of Fantasia. The next door neighbors in 1926 were a gas station and an organ factory. Although the area had been designed as a residential neighborhood, at the time the Disney studio operated there, it was generally a quiet, empty location with little activity and lots of unattended landscaping. In 1926, Walt and Roy filed a permit for a three-room artist studio that included two small offices for Walt and Roy Disney, a camera room, and a large partitioned work area for the animators and ink and paint staff. On the roof was an iconic neon sign identifying the studio as the home of Mickey Mouse. During the next four years, the original studio building underwent several renovations and additions until a two-story building called “Animator’s Building No. 1” and a sound stage were added in 1931. The studio had filled out the space between the organ factory in 1929 and by 1930 also extended out to the street. Walt and Roy purchased additional plots of land surrounding the studio and built the “Animator’s Building No. 2” (known as the Shorts Building) in 1934, Ink and Paint and Annex buildings were constructed in 1935, and a “Features Building” in 1937. Over the 14 years the studio operated, several other smaller buildings were constructed on the property including a warehouse, film vault, sound stage monitor room, camera room, and, of course, the famous garage that housed Mickey Mouse’s car. The studio even rented nearby bungalows for the story staff, as well as for Charlotte Clark and her crew, who were making stuffed Mickey Mouse dolls. It was apparent that the studio had become a hodgepodge of inefficient buildings and further expansion in the area would be impossible. In June of 1938, Walt and Roy paid a $10,000 deposit for a 51-acre plot of land in Burbank for the construction of a new studio to open in 1940. In 1941, half of the Hyperion Studio property was sold to Thomas Curtis Optical Laboratories for $75,000. The Weldon T. Thomas Company, a vitamin manufacturer, purchased the remaining property, basically the soundstage, for its business. 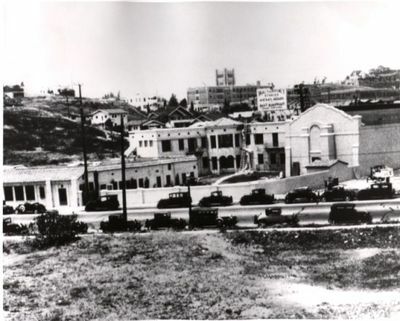 The original studio building (along with the other additional buildings) were completely destroyed by a bulldozer in August 1966. A Mayfair Market grocery store was built (later replaced by Gelson’s Market). There is a vintage photo of the Disney Hyperion studio posted inside of Gelson’s. A duplex from the former Hyperion Studio property still stands in its original location and is a private residence. 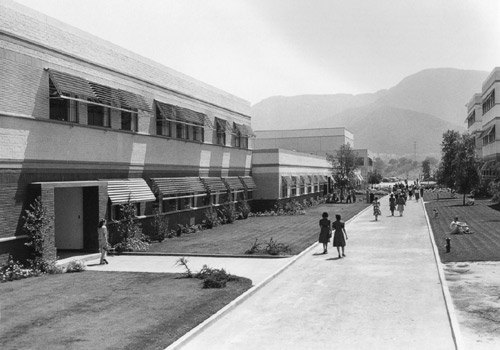 Before leaving the space in 1939, two Hyperion buildings were moved and combined to create the Shorts Building on the Burbank Lot. The Personnel Building that housed the Burbank Studio Store and Employee Center was likewise moved from Hyperion to Burbank. The Publicity and Comic Strips Building, which was actually a small wood frame bungalow, was moved to Burbank where it served as the Studio Mail Room for many years, and was moved again and renovated as two conference and meeting spaces, known as the Hyperion Bungalow and the Silver Lake Room (Silverlake is the neighborhood where the Hyperion Studio was located). It was in the Hyperion studio that Disney produced the last of the Alice Comedies, all of the Oswald the Lucky Rabbit shorts and the early Mickey Mouse and Silly Symphony shorts. 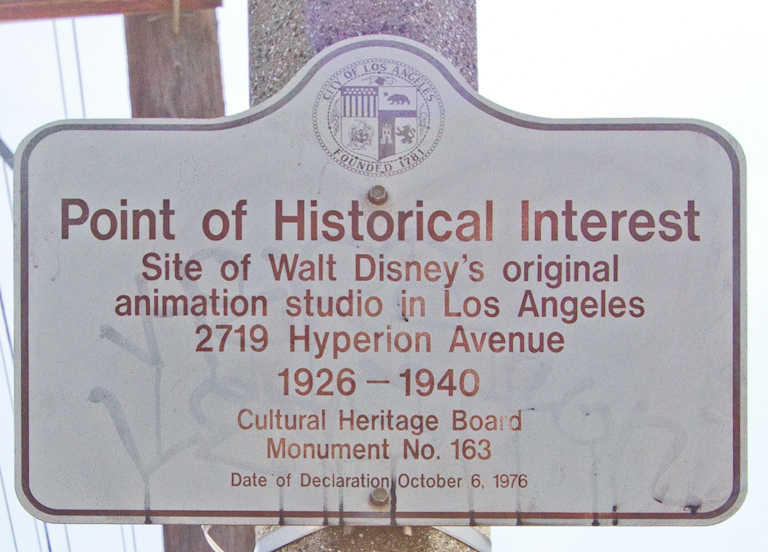 The Hyperion location was declared a historical-cultural monument in October 6, 1976 and marker No. 163 was installed. 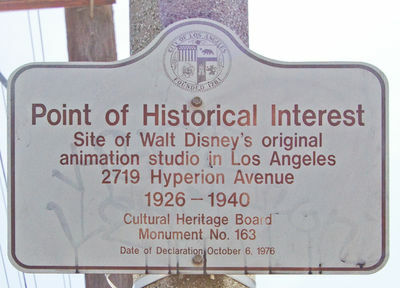 In 2005, the landmark was amended to include more area (2660-64 North Hyperion Avenue, 2646-64 North Griffith Park Boulevard, 3027-33 Angus Street) that among other things added the space for Disney’s first animation school. This is the corporate office for the Disney Company today. Some of the Disney Studio staff moved in as early as December 1939, but the move from Hyperion was complete by May 1940. Walt Disney's biggest concern with his new studio was that each building should be designed so that it would facilitate optimum production. The Animation Building was built to house the Story Department, directors, producers, background artists, layout artists, inbetweeners (animators who provide drawings between key poses, so as to provide a flow of movement), and similar personnel. Walt hoped having all these people together, even if on different floors, would help them to coordinate better with each other. Roy Disney's office, accounting and business department had their own first floor wing. The animators, clean-up artists and inbetweeners were also on the first floor. The directors had suites on the second floor, including a secretary and a separate room with a Moviola (a device that film editors used to view film while editing). Layout men, background artists and the Music Room were also on the second floor. The third floor was Walt's suite of offices, as well as rooms for the Story Department and the music composers. The Ink and Paint building was built directly across from the Animation Building with an underground, all-weather tunnel to connect the two buildings so that artwork could be transported without fear of wind, rain or extreme heat. Walt was adamant that he didn't want an "institutional" look very common in other studios, especially for the main Animation Building that was to be 250 feet long. Frank Crowhurst, was in charge of construction in 1940, supervising the architects and engineers. The primary designer was Kem Weber. For the soundstages: Stage One was built in 1940 and the live-action sequences for Fantasia were the first scenes to be shot on that stage. Stage Two was built in 1949 in co-operation with Jack Webb, who used the stage to film his Dragnet television series. Stage Three was built in 1953 for 20,000 Leagues Under the Sea and contained a large tank for underwater and special effects filming. Stage Four was built in 1958 and first used for filming Darby O'Gill and the Little People. Some of Disneyland was built on these sound stages and trucked to the Anaheim location. The studio water tower once held 150,000 gallons of water and was built at a cost of $300,000. Most studio water towers like the one at Warner Bros. have four support legs, but Roy O. Disney specifically insisted on six for this 135-foot tall structure. Massive changes to the studio were made by Michael Eisner when he was CEO. The fabled backlot was demolished and repurposed with office buildings. The Feature Animation staff relocated in 1985 to warehouses and trailers in the Glendale area. The building was converted into business offices in 1986. The animation staff returned in 1995 to a new building on Riverside Drive across the street from the studio, with an entrance designed to look like Mickey Mouse’s hat in the Sorcerer’s Apprentice segment of Fantasia, and dedicated to Roy E. Disney. There is also a Roy O. Disney building that used to house the Disney Archives, but currently serves as offices for Disney Legal. Michael Graves created an imposing Team Disney building with sculptures of the Seven Dwarfs supporting the roof in 1990. On January 23, 2006, it was rededicated as Team Disney—The Michael D. Eisner Building. The Frank G. Wells building opened July 1998 and, among other departments, now houses the Disney Archives. Thanks for another great article about Disney history! I think I'm going to have to plan a trip to California to see as many of these places as I can!